Will the San Antonio Spurs ever go away? Although we are about a third into the season, the Western Conference is yet to find its identity. None of the teams really stand out and make me say “that’s the team to beat”. People are really high on the Oklahoma City Thunder, but I’m not sold. Majority of the teams are just trying to stay healthy right now, thanks to the compressed season. This is one of the few times in which the entire conference is up for grabs. The Oklahoma City Thunder (15-3) is off to a great start as many of us expected. Besides the fact that they are talented, the fact that they have young legs really helps in this compressed season. It’s tough on a lot of the older guys to be playing four games in five nights. As good as they are, I still find them beatable. I don’t think they play smart basketball when their backs are against the wall, and will be exposed eventually. The Denver Nuggets (13-5) have been a surprise with a couple of their key players still being held hostage by the Chinese Basketball Association. I think the fact that they are young helps, but they also have a lot of young talent. They currently lead the league in assists and points, which means they move the basketball well. I think they have excellent depth and the great play of Danilo Gallinari and Al Harrington has really given the Nuggets a boost. It’s crazy how the San Antonio Spurs (12-7) just don’t seem to go away. Every year you hear about how they are too old to compete for a title, yet they always seem to make a run. I’m really impressed with the way the Spurs have played regardless of the injuries to Manu Ginobili and T.J. Ford. If you really think about it, the Spurs aren’t that old. Besides Duncan and Ginobili, we are pretty young. I think the Spurs have great depth at the two and three, which has accounted for Ginobili’s absence. If Tim Duncan, Tony Parker, and Manu Ginobili can all be healthy in April (hasn’t happened since ’07), then they can really make a run. The new look Los Angeles Clippers (9-6) have shown flashes of greatness, but they are yet to put it together. The fact they did not have an offseason or effective training camp definitely contributes to this. They obviously have a talented roster, one that is good enough to compete for a title. The biggest issue with them is team chemistry especially on the defensive end. At times, they are late on rotations and don’t communicate as well as championship teams should. The good thing is, they still have time to improve. The Utah Jazz (10-6) shocked us by trading away their star point guard Deron Williams last season, but they are still finding ways to win. Paul Millsap has really emerged into a starting power forward. He’s only listed at 6’8, but he plays a lot taller than that. The Jazz are really solid in the front court with Millsap, Al Jefferson, and Derrick Favors. If they want to keep up in the West, I think they are going to need a lot more production from their back court. Devin Harris hasn’t been the same player in the last couple of seasons and FA signee, Josh Howard, has been a disappointed since his arrivals. I don’t think a lot of people expect the Houston Rockets (10-8) to do much, but I think they can really push for a playoff spot. They got hot and went on a seven game win streak before losing to the Bucks last night, but that really shows how good they can play. The signee of Samuel Dalembert has been a big difference maker. He protects the rim and rebounds. Dalmbert is a good player to compliment Luis Scola. If they can show more consistency, then they should be able to nab a playoff spot. It’s crazy to think that a jus about 3-5 seasons ago, the foundation of the Portland Trailblazers (11-8) were Brandon Roy and Greg Oden. Now? Brandon Roy retired and Greg Oden hasn’t been healthy since the first game of his NBA career. I really like their current squad more than I have in any of the previous seasons. LaMacrus Aldridge still doesn’t get the respect he deserves. He’s quietly a top five power forward. If the Blazers can put a halt to their mental lapses then they have the potential to make a push…… Is it me or does that sound like them every season? The reigning champion, Dallas Mavericks (11-8), certainly hasn’t looked like reigning champions at all to start the season. Besides Dirk Nowitzki and Jason Terry, they really don’t have a player that can create their own shot or for others. 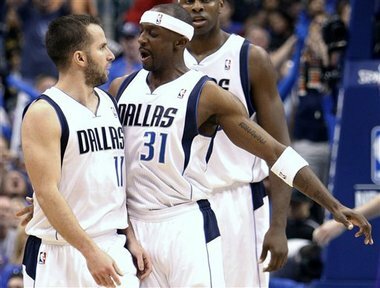 J.J. Barea used to be their playmaker but he’s now in Minnesota. Age has definitely caught up to Jason Kidd as he has been injured/ineffective all season. Even though they Mavs are currently outside the playoff bubble, they should be able to make a push, but I don’t think they are good enough to win back to back titles. The Los Angeles Lakers (11-8) are definitely not the bullies they used to be. They currently have the worst bench in the league and Kobe has to put up 30 plus just for the Lakers to stay in the game. I don’t think they can continue winning like this. They need some help from their bench, and Metta Peace has proven he can’t be that guy. I can’t see Kobe keeping this up for the entire season. If he does, the dude is going to be exhausted come April. They really need to make some moves if they want any shot to win a title in Kobe’s closing years. As expected, San Antonio will face the LA Lakers in the . . . woops. As unexpected, the Dallas Mavericks will face the young Thunder of Oklahoma City. Dallas has been on fire this year in the playoffs after being the definition of underwhelming the past decade. Oklahoma City has also has been a nice surprise riding on the young talented core of Durant, Westbrook, and Harden. This should definitely be an interesting series and is the typical experience versus youth. – Get into transition. It’s no secret Oklahoma City has an obvious youth advantage and I bet I’m not alone in saying they’re definitely more athletic. What the Thunder love to do is catch sleeping or sluggish teams in transition and beat them for easy baskets. Dallas loves to bully teams if they get time to slow teams down and get physical in the paint. Oklahoma City needs to always be looking to run and get the easy baskets. – Attack the rim. When looking at Oklahoma City’s roster, I could at least 3 players who can easily take their Dallas counterparts off the dribble (Westbrook, Harden, Durant) and that’s only counting the major minute players. Oklahoma City is shooting a cool 80.7% There are no real negatives to Oklahoma City attacking the rim, especially if they can get the Mavericks’ big men in trouble. – Don’t give Dallas easy shots. I don’t know why, but I think the Lakers forgot who the shooters on Dallas were. Every time I watched, it seemed like they would double the wrong players and let Terry, Peja, and Dirk get easy three pointers. Oklahoma City needs to understand who the shooters are and who they can leave out in the open. Collison is going to get the first crack at guarding Dirk and might actually have a good shot at pulling it off. He’s not as athletic, but he did a great job slowing down Zach Randolph in game 7 and all throughout the series. Collison will have his hands full, but if he can slow Dirk Nowitzki he could be the biggest factor in the entire series. Can the little guys come up big again? – Get the help defense ready. As mentioned above, Oklahoma City is definitely the more superior athletic team. Because of their ability to get to the rim and take defenders off the dribble, the Dallas big men need to be ready to help out on defense and rotate. They need to be active and willing to help out and not just let the Thunder run by. – Get Dirk mismatches. It’s not really necessary, but Dallas needs to continue to use screens create mismatches for Dirk. He already is an offensive star on his own, so it makes it even easier if he can drive by a big guy or post up a guard. Oklahoma City will already have a problem with Dirk so screens will just make that even tougher. – Continue the excellent ball movement. I always notice Jason Kidd makes the extra pass on offense and isn’t greedy in the least bit (hence why his assist numbers are always huge). However, the entire Mavericks team seems keen on quick passes to get defenses off their game plan. With Oklahoma City being inconsistent on defense, this could be a huge advantage for Dallas. Seems a little weird to say the X Factor is a well known commodity, but with how he played against the Lakers he showed how he can make a difference. He shot at around 68% from the three point line. Considering Dallas seems to live and die by the three, Terry needs to continue his hot shooting streak and make teams pay. Dallas has been playing lights out in the playoffs, but they always seem to find a way to disappoint. Durant and Westbrook proved they know what it takes to win. Oklahoma City in seven. This is going to be a tighter series than you would expect. Despite Rudy Gay’s season-ending injury, the Grizzlies are still no walkover. They possess good front-court size and can dominate the paint. The Grizzlies lead the NBA in points in the paint, which is very critical for post-season success. What they do lack is experience. The entire San Antonio starting five has NBA Finals experience as the Grizzlies have never even won a playoff game. The Spurs have had some trouble defending the paint due to their length (lack of), so Zach Randolph will be a huge factor in this match-up. Antonio McDyess and Dejuan Blair will have their hands full. Memphis might be able to steal a couple games, but in my opinion, the Spurs are just better. San Antonio’s discipline and intensity will eventually wear out the Grizzlies. We also got to remember, they are the Grizzlies. Spurs, Manu Ginobili: His health will be very critical, as I believe the Spurs will have some trouble without him. His ability to create for his teammates and knock down big shots is irreplaceable. Without him, this series can go seven. Grizzlies, Tony Allen: His playoff experience and leadership can very well be a boost to this young Grizzly team. Allen has the abilities to impact a game, both offensively and defensively. The Hornets are limping into the playoffs after being waxed by the Mavs, and things don’t expect to be looking any brighter when they visit Staples Center. The Hornets have been struggling even more than the Lakers have. It doesn’t help when your star power forward (David West) is out for the season either. The defending champs understand what is necessary to take care of business. The Lakers must be able to slow down Chris Paul, since quick point guards have been their area of weakness. Derek Fisher won’t be able to stay in front of Paul, therefore, team defense is essential. I think that the length of the Lakers will make things difficult for New Orleans. The Hornets aren’t a great three-point shooting team so they will have problems stretching the floor. They also have no depth, and in my opinion, they aren’t that good. There is no way Kobe Bryant will allow his team to lose, especially when you have this guy in your corner. Lakers, Andrew Bynum: His play/health will dictate the entire playoffs for the Lakers. The front -court pairing of Bynum and Gasol is the biggest in the league. If Bynum plays well, the Lakers can very well be headed to another NBA Finals. Hornets, Chris Paul: Even if CPIII averaged a triple-double, the Hornets would still lose in six. This matchup interests me the most since we are all aware of the Mavs’ first-round woes. The Blazers have been dangerous since acquiring Gerald Wallace, not to mention, the return of Brandon Roy. Their versatility gives the Blazers the ability to match-up well against the Mavs. Dirk Nowitzki will have to continue to carry his team if they want to avoid another early exit. It will be tough as Portland can throw Aldridge, Camby, and Wallace at him. During the last couple of seasons, everyone has been on Portland’s jock and I think, finally, this will be the year it pays off. Mavs, Jason Kidd: Point guard play will dictate this match-up since Kidd has been playing like garbage for the past month. Not only must he be able to find his teammates, he must be able to pull the trigger on the open three. Blazers, Brandon Roy: If Roy can show some consistency, he may be in for a big series as I don’t think Kidd or Beaubois can match-up against him. The Nuggets got away with murder by absolutely killing the Knicks in the Melo trade; producing an 18-7 record since shipping him to NYC. The Nuggets now have depth across the entire line-up. On the other hand, the Thunder have grown up quickly since last years’ playoff run against LA. They even acquired Kendrick Perkins to boost their interior defense. This match-up can go either way since both teams match up so well. As much as I like the Thunder, I honestly think the depth of Denver will give fits for Oklahoma City. You can never have enough depth in the postseason. Thunder, Kendrick Perkins: People tend to forget that if Perkins didn’t get injured, then it perhaps might have been Boston hoisting last year’s trophy. His experience and interior defense will be huge for OKC. Nuggets, Team Depth: Eight players averaged double figures in the regular season. If J.R. Smith, Raymond Felton, Al Harrington, and Wilson Chandler can continue that in the playoffs then this team is going to be scary. Will "The Big Fundamental" miss out on All-NBA honors for the first time in his career? Despite the injury-bug, the Bulls still finished as the top seed in the East. Chicago is an impressive 38-15 when Boozer, Noah, or both sit out. You can thank the heroics of Derrick Rose for that, as he simply continues to make big plays for his ball club. Many will argue Thibodeau or Pop, but Karl managed to coach two different Denver teams into the playoffs. That’s no easy task. His presence in the paint makes a huge difference for the Magic. Dwight continues to be a force at blocking and altering shots. This was a given back in December. His versatility off the bench has caused mismatches for many opposing teams. He only put up some of the best numbers of his career this season. Dorell increased his scoring average from 7 to 16; not to mention, leads the NBA in three’s made. Pierce will be looking to defend his crown. I was very surprised to see Kevin Durant’s name in the shootout. Not to take a knock at the kid, but he hasn’t been so hot beyond the arc this season. He is only averaging nearly 35% which isn’t even in the NBA top 40. On the other hand, I was glad to see Ray Allen up there since Allen will be the NBA’s All-Time 3-pt leader by the end of the week. Also, one last shout out to “Boobie” Gibson, as the Cavaliers have a shot to win in something since they can’t win an actual game. Why do I even bother with the All-Star game anymore? In my opinion, the NBA All-Star game is a joke; just like the Pro Bowl. It usually consists of fan favorites and high-flyers, which is pointless. It’s more of a popularity contest and sometimes the more deserving players get shafted due to playing for smaller market teams. This is what I think the Western and Eastern All-Stars should look like.